My baby boy at about 6 months old. He'll be 7 months next week! 7 months?! No way!! Where did the time go? He's so cute! WOW, 7 months already. How cute and big. Growing to be such a big boy! Love that smile and those curls! He is such a cutie pie! Great photo! GET OUT! When did that happen?!?! They sure do grow fast!! 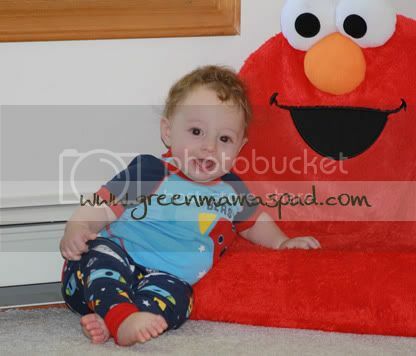 What a sweetie (love the Elmo chair too). He's adorable! My daughter would flip for the Elmo chair. He's adorable. I like the Elmo, too. Awe what a lil cutie. They do grow up way too fast! He's totally working the camera at 6 months! How cute is that? I bet time is just flying for you. Marianna, He looks just like his big brothers.. absolutely adorable. When are you coming back to blogging?? I miss you! Do You Bring Your Own Food To The Movies?